By providing more than just images, radiologists can bolster their consulting relationships with other physicians. Quantitation is proving a good first step. 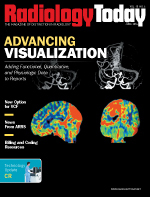 Advanced visualization typically brings to mind 3D images. However, in the coming era of value-based care, providing the image may not be enough. “We thought that our job originally was to say, ‘Here is the data set and the 3D volume, and now it’s up to you to do the quantitation if you believe it’s worthwhile,’” says Paul Chang, MD, FSIIM, a professor of radiology and the vice chair of radiology informatics at the University of Chicago Medical Center. As radiologists embrace quantitation, they’re exploring how to use advanced visualization applications to better patient care and potentially increase collaboration between themselves and clinical colleagues. “One thing we’ve seen [from radiologists] is the desire to collaborate with other clinicians to evaluate clinical decisions and to determine the diagnosis and treatment plan for their patients,” says Nichole Gerszewski, a brand manager at Vital Images, a Toshiba Medical Systems Group company. For example, Gerszewski says radiologists are adding quantitation to reports and adding value to their services with applications such as Vital’s TAVR (CT Transcatheter Aortic Valve Replacement), which can measure the aorta and provide that information to the cardiologist. “Going above and beyond like this is becoming more common,” she says. Bradley Erickson, MD, PhD, a radiology professor at the Mayo Clinic in Rochester, Minnesota, agrees that in the past, the technology was about visualization, but it’s increasingly becoming more about quantitation. At the Mayo Clinic, he says, radiologists and other physicians use advance visualization tools in multiple clinical areas, particularly endovascular treatment planning. The clinical applications allow for aortic measurements, which then may provide more data for cardiologists and surgeons when planning treatments. “Clinicians want to make sure they are getting all the information they need, and radiologists now are able to provide richer information for confidence in clinical decisions,” Gerszewski says. In other words, cancer treatments may no longer reduce the tumor’s size, which was used as a marker of the treatment’s effectiveness. Instead, the tumor may be made to slow and remain unchanging; therefore, radiologists can’t rely on physical measurements but rather on physiology through perfusion. Chang says it’s becoming increasingly important to combine all of the information—3D images, morphology, and physiological or functional quantitation—to provide a well-rounded report to aid in patient care. When doing quantitative assessments, it’s imperative that radiologists provide consistency, which may present a problem when considering the variability when different radiologists use the clinical applications for different measurements. To mitigate human error, radiologists are trying to maintain consistency through training and software developments. Tanenbaum emphasizes the importance of accessibility to advanced rendering around the clock and throughout the enterprise when dealing with patients with acute stroke. He says that Olea Sphere allows institutions to avoid concerns over variable technical personnel training levels across shifts. “Say a patient presents with stroke at 3 o’clock in the morning. Having the script-driven advanced visualization software process distribute the rendered perfusion images without the need for technologist or physician interaction is very powerful—trusting that the output is quantitative, accurate, and reliable is critical,” he says. At Erickson’s facility, technologists are trained to obtain these measurements, especially when quantitating for cardiology. The training can reduce the variability that can occur and help technologists maintain a consistent output, especially if they’re accustomed to measuring areas such as the aorta’s opening every day. While a physician could perform this task, he or she would have to be available around the clock to meet the demand. Erickson says the best way to maintain collaboration between radiologists and other specialists is through clinical care conferences. For example, he attends specialty conferences in epilepsy and head and neck care. He says radiologists and specialists can discuss the more challenging cases at these events, and they may provide an opportunity for radiologists to present quantitative solutions. Chang believes that while advanced visualization does allow collaboration through the exchange of 3D images, collaboration can and must extend even further than that. “Advanced visualization is just a tool. It doesn’t mean we’re going to foster deep meaningful collaboration with our colleagues,” he says. Real collaboration requires more than the radiology report. “So let’s say I do advanced visualization, all the fancy stuff that combines the 3D with the quantitation. The challenge we have now—and the limitation—is what’s the end result of that? It’s still the same-old narrative-based radiology report. Even with structured reporting, it doesn’t capture the richness of advanced visualization,” Chang says. He sees the next step as combining advanced visualization’s tools and clinical applications with robust enterprise-level communication. He says children provide the clues to a better communicative platform. “When you look at our kids, they have 20 different ways to talk about trivial things with each other through Facebook and Twitter, but a lot of that is collaboration,” he explains. These social tools are real-time, multimedia solutions, and these qualities could inform a richer, more collaborative tool that fully realizes the abilities of advanced visualization, he notes. Quantitation may be an important first step in collaboration with specialists and in patient care, but it will take a lot of ingenuity and creativity for advanced visualization to reach its potential for enterprisewide communication and collaboration that Chang envisions.